I recently retired as a criminal profiler after working on over a thousand serial murder and sexual homicide cases and creating the profiles of female serial killers. I trained thousands of police officers, CIA and FBI agents and interviewed twenty five serial killers and mass murderers. I was famous for how accurate my profiles tended to be. Many, many times, shrewd detectives told me I was so accurate it was eerie. There was a reason for that, a truth that I kept secret. I kept this secret because telling the truth about this subject is often taboo. The truth is that I am a psychic medium. From the time I was little, I had spirits around me. I didn’t think it was strange because I thought everyone did. My family was very open to psychic phenomenon, and my mother’s aunt was also a practicing psychic medium. But even though I experienced things first hand, like knowing people’s secrets, I was very skeptical. It became harder and harder to hide my abilities when working with police because I’d come up with things I had no way of knowing. And more than one shrewd detective outright asked me if I was psychic. The reality is that people use their intuitive skills every day. You know when you meet someone, and your gut tells you that something is wrong even though the person looks normal. Perhaps something tells you not to take a certain route to work, and you later learn by doing so you avoided an accident. I’m sure many of you have stories of where your intuition saved you from something bad. When I released my terrorist profiling book Disturbed in November 2008, I predicted that India would have the next big terror attack. I knew for a fact that they would be hit and hit big soon. Within two weeks of releasing my book and making this prediction, the Mumbai attacks took place. I recently did a private reading for someone and kept hearing ‘Supercalifragilisticexpialidocious’ playing in my head. It is like when you get a song stuck in your head. It kept playing until I told the client what I was hearing. She was shocked and told me that her daughter had texted this to her two days earlier for no reason. She noted how her young daughter had spelled it correctly and how unusual it was at the time. I told her that her mother in spirit kept showing me the pearl necklace and that she really wanted her daughter to have the necklace. The client told me that when her mother died, she had gotten the pearl necklace but that her father had taken it and not given them back. This entry was posted in Uncategorized and tagged afterlife, deborah kauflin, ghost, paranormal, psychic detective, schurman-kauflin, spirit on December 2, 2013 by spiritdeb. They are special, no doubt about that. They have their own ways of seeing the world and communicating. And though it can be trying at times, having an autistic child can make your heart grow. These children have so many gifts and can teach us patience. But they have other abilities as well. Autistic children are magnets for spirits. It is like they are an open door that allows the unseen to come in. If you have one of these special children, you may have noticed that things happen around your house. No, I’m not talking about the normal things in a child filled home. I’m talking about unusual things. Ghostly things. Things that go bump in the night. Unseen beings like autistic children. There is no escaping that fact. Because they process information and see the world differently, autistic children are more likely to see spirit activity. They often witness it way before anyone else in the home. They are more sensitive to such things, and they cannot lie. So when they look at the ceiling and react as if someone is talking to them, then you know you are dealing with truth. They really are seeing and hearing something. Naturally, you shouldn’t assume it is a ghost when such a thing happens. You must always consider the possibility of hallucination. Medications or mental illness certainly can have that effect. However, when others see and hear the same things, then you have to consider ghostly origins. Take Melissa for example. Melissa is a single mom to 12 year old autistic Daniel. From the time he was little, Daniel would look up at the ceiling and react to some invisible being. As he got older, Daniel would draw pictures of an old man in a cowboy hat and say things like ‘he here.’ He’d point to the picture, then at the ceiling. With time, Melissa became worried about her son’s mental health and took him to a neurologist who found nothing wrong but referred Daniel to a psychiatrist. Though Daniel showed no other signs of psychosis other than seemingly seeing something in the home, the psychiatrist said Daniel was psychotic. This was a real blow, and Melissa was devastated. Yet, Daniel wasn’t the only family member to see the old cowboy. Even though Melissa hadn’t seen him, her mother had. And Daniel’s nine year old brother had seen and heard the man as well. It wasn’t until a neighbor saw the cowboy that Melissa began to believe there was more at work than a psychosis. Living in Texas, it wasn’t a stretch that you might see an apparition of a cowboy. And Melissa began asking questions about the area where her family lived. She never did find out if anyone had died on the property, but after asking around, she found there were other people in the neighborhood who had had strange things happening in their homes too. They talked about things moving on their own. Doors slamming when the windows were closed. Melissa is convinced that her family has contact with the paranormal. She is very angry that her son was labeled as psychotic when he clearly was not. Since coming to terms with it, the activity has lessened. Another case involved Billie and her husband Ray. Billie and Ray were at their wit’s end when their autistic daughter claimed to see people who weren’t there. Naturally they were terrified of bringing her to a mental health professional for fear of having their daughter hit with a label. They took their concerns to their primary doctor who told them that it likely wasn’t schizophrenia and that they should not fear seeing a psychologist. Reluctantly they took Elle to the psychologist. Thankfully, this professional was not the type to jump to conclusions and didn’t find evidence of schizophrenia or psychosis. She did say that Elle was very imaginative and it was likely the product of an overactive imagination. Elle was given a clean bill of health, but the family was confused. Elle really believed what she saw. Maybe it was their apartment, they thought. Maybe being there was too noisy. There was constant traffic and construction. Their lease was coming due anyway, so they decided to move. A change of scenery could help, they thought. But it seems that the spirit wanted to hitch a ride along with them. Elle didn’t let up in her behavior after the move, and neither did the spirit. In fact, now it wasn’t only Elle who experienced the vision of the Asian man. Billie began dreaming of him. Her husband Ray had the feeling of being touched when he was in bed. What was going on? Billie had a friend who knew someone who was psychic. She asked if the psychic could help, and the psychic agreed to do remote viewing of the home. Without telling the woman anything, Billie was shocked when the psychic talked about an Asian man who had been killed in a robbery. She said the man was named Ron and had followed Elle home when he saw her. She said the man meant no harm. He simply wanted to be seen and heard. The psychic told Billie that if she spoke to Ron and told him that he was scaring them that he would go away. Reluctantly, Billie took an afternoon when everyone was out of the home and had a ‘talk’ with Ron. She told him he was scaring them and that they wanted him to leave. Billie reported that she heard a loud bang after she told Ron to leave. Was it the neighbors? She wasn’t sure. However, after her ‘talk,’ the activity in the home decreased. Though Ron didn’t leave, he did tone it down, enough that the family could deal with him being there. Many, many people with Autistic children seem to experience the paranormal. If you have had this happen, then you should know you are not alone. It is not unusual. But this can add so much stress to an already stressful situation. How can a family cope with strange happenings on top of dealing with a special child? First and foremost, if you have this happening, take a deep breath before doing anything. Don’t jump to conclusions. If your child seems to be interacting with something that you cannot see, don’t automatically assume that it is paranormal. Always look for a physical or psychological cause for any unusual behavior. Check with doctors and check medicines. Always take care of your child’s physical and mental health. 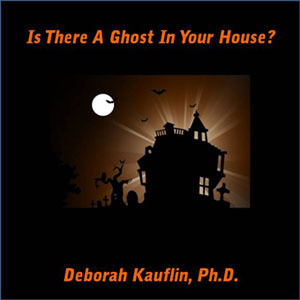 At the same time, if you have ruled out other options and more than one person in your home is having strange experiences, you may want to consider the possibility that you have ghosts. This doesn’t have to be scary for you because you are in charge of your house. If you have an unwanted guest, tell him to leave. If you invited a friend over and he brought an obnoxious guest, then you would tell the guest to leave. Spirits are no different. If someone is unwelcome, then tell them. You are in control. Finally, look at it this way. Once you realize that there is a spirit world, you can relax knowing that there is more than this life. This should bring you comfort, not fear. There are so many wonders in this world, and we will never know everything. Spirits are real. There are honest to goodness hauntings. Some may scare you, while others are helpful and comforting. Just know that your child is more special than you even knew! And if you are one of the parents living with a child who is different from others, please understand that you are special too. You must have a wonderful heart to have been given the chance to have a unique child. This entry was posted in Uncategorized and tagged afterlife, autism, deborah kauflin, ghost, haunted, haunting, paranormal, schurman-kauflin, spirit on December 1, 2013 by spiritdeb.